On Saturday I woke up early, did 1 hour of exercise and I had fish for lunch. Then I went to play the €1100 freezeout at 14:00 and I'll tell you the main plays! I believe I made a mistake during a play post-flop against Liv Boeree. I think we were 100bb deep, she raises utg 3BB, I have AK on the button and I raise to 9BB. The flop comes JJ4 and I check, turn 4 and I bet another 10BB and she calls. River blank check check. I probably should have fired 2-3 bullets or just check/fold until the river. In any case, my play was the worst possible. Her range as a general rule should be pairs inferior to KK or inferior to QQ, something like 22-JJ or 22-QQ, on the flop I think that she would never fold to a cbet, but I also think that she wouldn't check-raise, so if I made a cbet, I would see 2 more cards without putting any more chips in. By betting on the turn, I risked her betting the turn in which case I would have to fold. The option of 2-3 bullets seems more complicated, because I don't know how she sees me... you can't imagine how complicated it is to play with a patch that says "online". Anyway, on the turn I put her to 55-TT and she showed 99. I didn't lose a lot, but I believe I missplayed. UTG with 25BB limps and there are 3 more limpers. 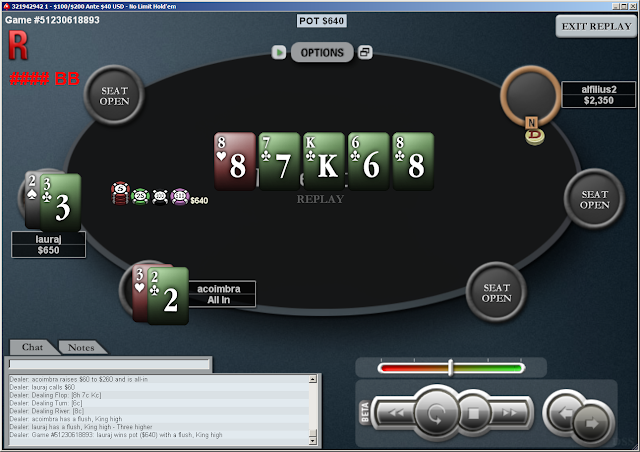 I was on the button with A5o and I had strong reason to believe that the utg was not slowplaying. I raise 8BB and the UTG goes allin... everyone folds, I call and he shows KTo. Unfortunately I lost. At the turbo tournament, there were 30 players (it paid to top 10) and I have 14BB on the BB. A player makes a miniraise and another player calls. I have 33 and decide to just call. (With the antes and the money that was already in the pot it can't be awful). On Thursday when I went to sleep I had quite a lot of cafeine in my blood and I couldn't stop thinking about what I could have done differently in order to win the tournament. Therefore, I didn't get much sleep. That had an impact on my performance at the €2150 freezeout on Friday. In the meanwhile, at every tournament that I play, I learn something new and that is priceless (or maybe not... in this case it was 2150 for the lesson :P). Maybe that means that I'm inexperienced, which is something that I won't deny, but until we start getting some experience... we all are! My girlfriend said that I sounded happier on the phone after losing the €2150 tournament, than the day before that I got 3rd place at the €1100... I believe it has to do with the fact that losing before making it in the money is the most common case and since there aren't many "title shots", I'm feeling quite disapointed when I get one but I don't manage to win. It's one of those things that only someone who has finished in 1rst, and 2nd/3rd place in tournaments is able to understand. On Saturday I planned to play the €1100 freezeout and if it went bad in the first 5h, I wanted to play the €330 turbo. I'm starting to think that the turbos without bounties is a format with tendancy to desappear and be replaced by the turbos with bounties. That's because the second format is more fun, more interesting and there is more skill involved... it's an easy choice. Yesterday I slept until late, watched a movie and went to the gym of the hotel for about an hour or so. After that I took a shower, had a salad for lunch and went to the casino. I played the turbo bounty of €1100 and I finished in 3rd place. It was a tournament that lasted until 2 o'clock in the morning, we spent most of the time playing with 8-15BB and I think that's where my edge is bigger, although it has of course an enormous variance. My last 3 all-ins were 60-40 and I lost them. I admit that I got out of the casino feeling a bit down, but at tournaments there is only one winner and what happens most of the times is that we don't win. Today I'm playing the €2150 freezeout, and then I'll make a post about how it went. 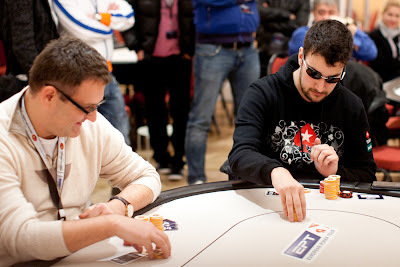 Two days ago was the 1st day of EPT Vien and unfortunately I didn't survive until the end of the day. I'm still missing a bit of self-control in certain situations, I need to stop thinking "why is he doing this?". But I think that when I fix that, the results will improve significantly! I also played a 430 turbo bounty, but I think I played flawless and I just had a lot of bad luck. This Wednesday I had a downswing of quite a lot of buy-ins at the $130, which is at the moment the highest stake I play. As I didn't manage to sleep at a decent time, I only slept 4 hours before the cleaning lady rung the bell on Wednesday morning. I could have gone back to bed, get up late and play a bit after, but I decided to break that rythm. I stayed awake all day long! It was funny to see the 1rst player I played against call me donk after losing from me. At least in Magic the community is less harsh than at online poker, people don't wish you cardiac arrests, cancer or death. There are only small insults! Today I woke up early in the morning without an alarm and I have to tell you... there's something special in waking up early and having the feeling that the whole day is ahead! Back when I was studying, I thought I was more a person of the night, I enjoyed waking up in the afternoon and I only went to sleep with the first light of the sun. Now it's the opposite... Maybe it has something to do with the fact that I am a rebellious mind and I like to do the opposite of everyone else. When I was at university, the normal thing was to go to classes in the morning and early afternoon, now that I play poker full time, the normal is to start playing online championships late in the afternoon, some of them even after dinner and eventually stay up all night. Why does that matter? It doesn't. It wasn't even a great morning, but I felt quite alive, with all the day ahead of me and infinite possibilities! I have been going to the gym, but I still haven't had my physical evaluation in order to make a plan. It seems that always when I get an appointment, something unpredicted will happen and I miss it. The next one is scheduled for November, and maybe this time I will go one hour before or something like that just to be sure that I'll be there on time! Until I get my plan, I have been attending classes that are focusing on balance and when I go out of class time, I do one hour of cardio and some abs as I mentioned in a previous post. At the gym I go to every one gets their own locker and the other day while I was in the locker room, a man opens his locker and keeps staring inside. Up until that point all good, but then he starts smiling and closes it. He opens the one right next to it with the same key and then I realized what was happening, started smiling too and talked with him about it. If there is anything I don't want to be universal and compatible, that's a lock, so it's worth to pay a bit more to get one with a unique key or one with a code. I use a lock with a code, it only has 1000 combinations, but I believe that if someone tries to open my locker they would probably be caught, so I feel that my trousers and shoes are relatively secure! If you still haven't watched Phil Helmut's scene at "The Big Game", go watch it! 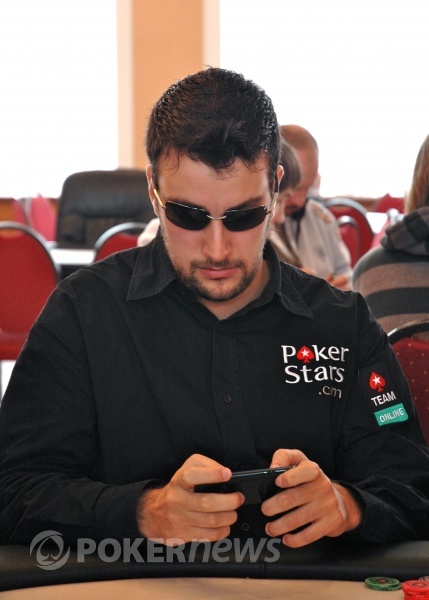 There were also some changes at the VIP System at PokerStars at the beginning of this month. The biggest part of them concerns cash games players, but there was one that was important for all players. Now, when we change FPPs for a money bonus, the money automatically appears on the account, it's no longer necessary to unblock the bonus. What this means is that the FPPs at PokerStars gain even more liquidity and that's great for all players! To finish this post... Watch this video and leave a comment with your opinion. Last week I had some bumps, but for now I am still slightly positive pre-points this month. According to PokerStove we are talking about a situation of 1.51% where we had the same stack more or less at the bubble! acoimbra didn't show 7 , 5 (nothing). Las week I didn't manage to go to the gym as much as I wanted, I had to stay at home two mornings because of furniture delivery and the cleaning lady. By the end of the week I had done 2 hours of cardio and 1h pilates, so it wasn't all that bad. I hope you liked the HHs and I'll see you at PokerStars!